This Background Vocalist only taped 13 TV appearances in 2010, but the income continues to flow long after the original taping. She’s typically paid for appearances by the production company or a third party payroll company that the production company has hired to administer its royalty payments. She receives the mailbox money from different sources depending on the kind of reuse and the union administering the reuse. This income is often received as individual checks for each TV episode and production company. Here is this Background Vocalist’s income distribution for 2009 and 2010 for her television and film work. 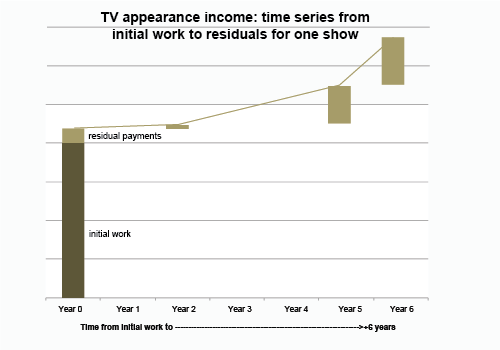 Salaried work for TV and film appearances makes up about half of this Background Vocalist’s television and film-related income in 2009 and 2010. The other half of her television and film-related income is mailbox money. This singer earns nearly as much from mailbox money from TV/film appearances as she does from the appearances themselves. The mailbox money provides a significant, long-term revenue source that can grow as TV and film content is repurposed, made available on new platforms and in a widening number of markets. In addition to the annual payment scale negotiations, SAG-AFTRA also negotiates and oversees residual payments – the mailbox money – for vocalists who appear on commissioned music or live performances on television or movies. After the original taping, artists can receive additional payments if the show is rebroadcast on network television or cable, goes into syndication, is shown on foreign television, or reused in other ways. Below is a chart that explains different residual uses, how the artist fee is calculated, and the payment schedule for such uses. These are examples that apply to all SAG-AFTRA members, but not necessarily to this Background Vocalist’s particular situation. Foreign: reused in foreign territories CBS’s The Late Show with David Letterman (featuring a live band and musical guests) is broadcast in Sweden. Either: 35% of original scale is paid up front to cover multiple uses and reuses in multiple markets. This is a one-time only reuse fee. Most do this. 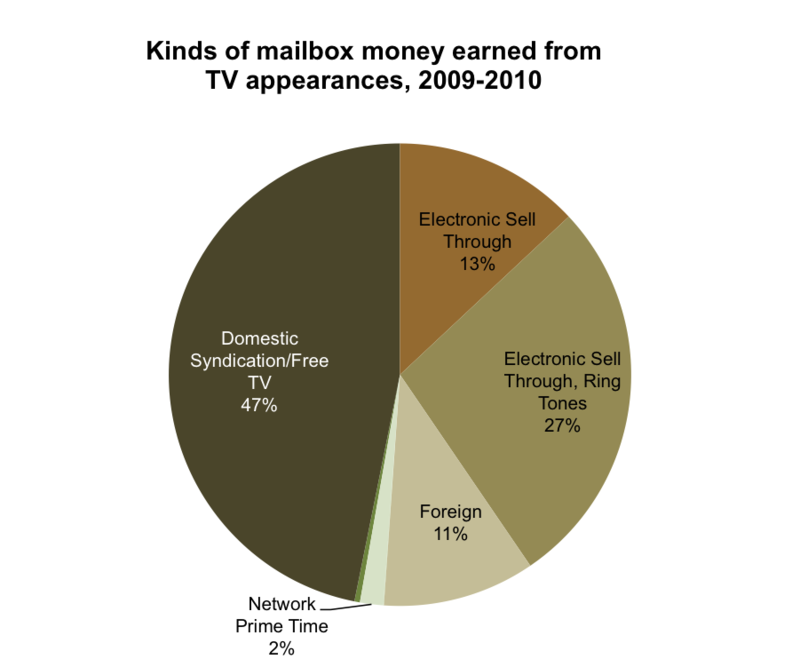 Here’s a chart that represents the breakdown of this Background Vocalist’s identifiable TV/Film mailbox money from 2009-2010. Nearly half of her residual income is from domestic syndication, and 11% comes from foreign syndication. Forty percent of residual income comes from the digital marketplace. The income generated here is from dozens of episodes of nine different television shows. This chart illustrates the Background Vocalist’s income from one episode of her main television show. The receipt of this income is spread over six years. Each column of this chart represents an amount of income received from residuals at a point in time over those six years. 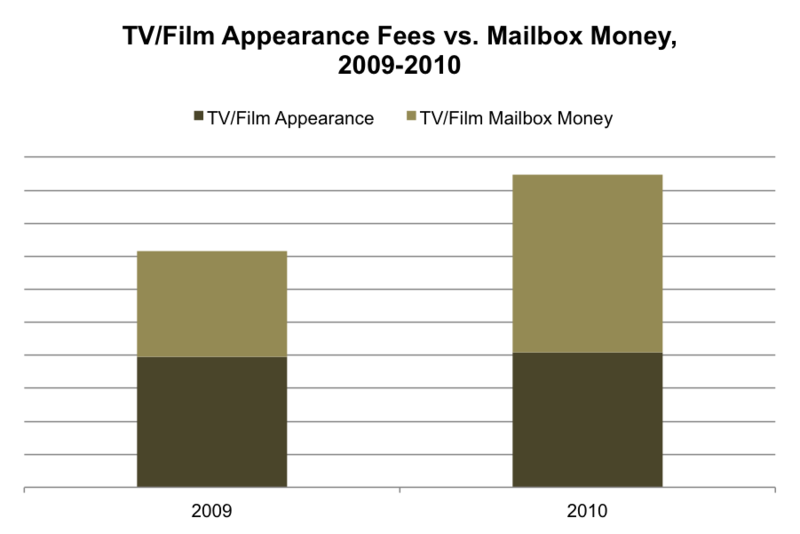 If measured as one financial transaction, 39% of income from this television appearance derives from mailbox money, though the income trickles in over an extended period of time. Information detailed in case studies is based on data received directly from the artist or their authorized representative. The data analysis and lessons learned here are based on individual experience, and do not necessarily reflect the experiences of all musicians in genre or roles. Case studies are one of three ways this project is looking at music creator income. Artist Revenue Streams is a multi-method, cross-genre examination of how US-based musicians' revenue streams are changing, and why. This site is the home of our project's releases and findings. We will issue multiple reports and presentations here from Jan 2012 – Dec 2014. Are Musicians Making More or Less Money? How Many Musicians Are There? Future of Music Coalition | 2217 14th Street NW, 2nd floor, Washington, DC 20009 | (202) 822-2051. The Artist Revenue Streams site is powered by Wordpress. Super-Skeleton theme by Brandon R. Jones.